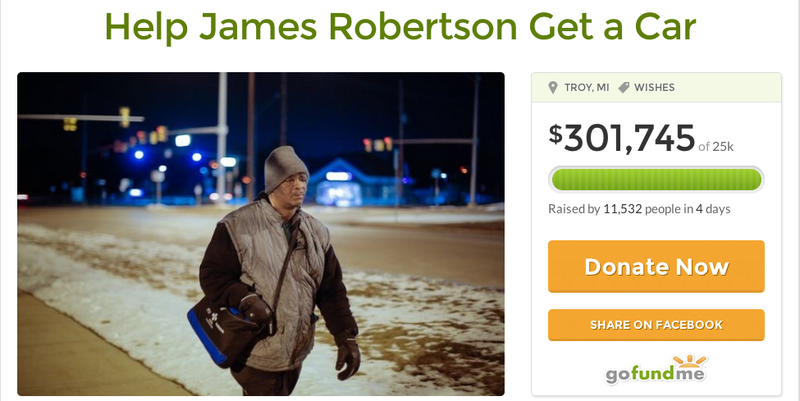 James Robertson walks 21 miles every single day to commute to work. He hasn't had a car since his broke down... 10 years ago. His story became public this week and was met with an outpouring of support from around the country. Now, James is set to get more than $300,000 from a GoFundMe campaign. He's also getting a Ford Taurus. For free. Robertson's story first appeared on the Detroit Free Press, extolling the virtue of Robertson's perfect attendance record to his manufacturing job in Rochester Hills, MI, which is 23 miles from where he lives in Detroit with his girlfriend in a house they inherited. Due to a decrepit and, frankly, pretty terrible public transit system, just a couple of the miles on Robertson's daily commute can utilize the bus. Still, Robertson does it every single day, five days a week. The manager of Schain Mold & Engineering, where Robertson works, says that he sets the attendance by this man. If he can be there, so should everyone else. When Robertson's story popped up last Sunday, it was a fascinating read. But it also made people wonder, why hasn't anyone helped get this man a car? Granted, Robertson hasn't asked for any help at all from others. It didn't seem like he saw his problem as a problem others needed to handle. He just took care of himself and did what he needed to make sure he had a roof over his head. Even though he didn't ask for it, people started spreading the word. Our good pal (and occasional columnist) Steve Lehto wrote a post on Opposite Lock about getting Robertson a car. The story started spreading around the internet, getting picked up on social media and then by local, national, and international news sources. People wanted to know how to help Robertson get a car. While the story was spreading, college student Evan Leedy saw the comments and decided to set up a GoFundMe page with a modest target of $5,000. Just enough to get a car that would help Robertson get to work. "I only posted it on the Detroit Free Press's Facebook page," Leedy tells us. "The power of social media did the rest." And did it ever. It blasted through $5,000 in no time. Leedy upped the target to $25,000. It soared through there. After Robertson did a series of local and national interviews, the fund had $300,000 from people who felt that Robertson had earned that money for his years of hard work making $10.55. But it also had more than that. They've gotten a ton of crazy offers. "We had NBC want James to go on their new Lebron James game show, The View wants James on their show, we had someone offer to send him foot cream, a lot of wild stuff!" says Leedy. Robertson was also asked what kind of car he'd want by Blake, a man who tries to give Robertson rides whenever he can. Robertson said he liked the look of the new Ford Taurus, red with a black interior. Tomorrow, along with all of the money from the GoFundMe campaign, Robertson is getting a red and black Ford Taurus, courtesy of Suburban Ford in Sterling Heights, MI. Hehas no clue that he is getting this car (We spoke to Leedy, who said that Robertson doesn't have a phone or computer and was still in the dark). That's really quite the windfall for a man who was only doing his job a week later and had someone ask a few questions about it. Robertson reportedly doesn't plan on moving or quitting his job, instead he wants to be responsible with the money. That's a good move. Don't do what we'd do and buy 100 Craigslist Miatas.